Stock up on Maxwell House!! About one in five of the world’s plants is threatened with extinction, and the 60% figure is an "extremely high" one. 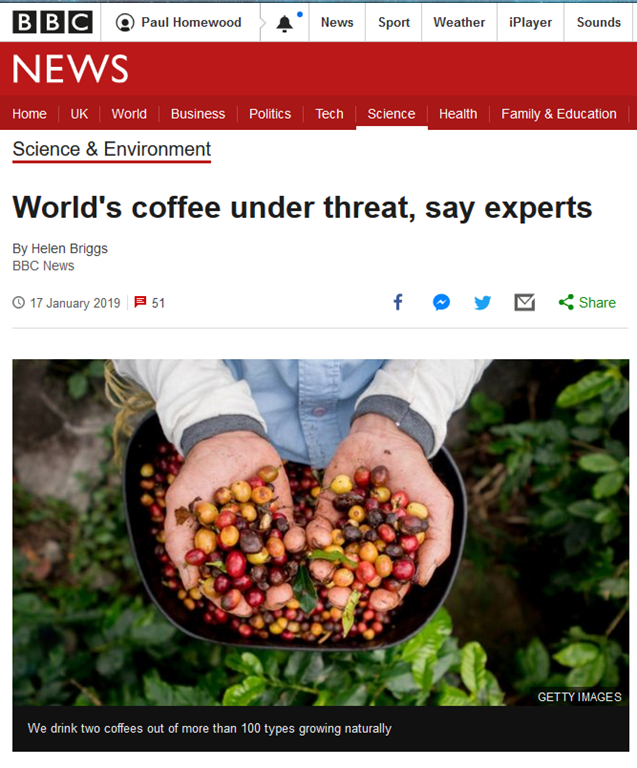 "If it wasn’t for wild species we wouldn’t have as much coffee to drink in the world today," said Dr Aaron Davis of the Royal Botanic Gardens, Kew. "Because if you look at the history of coffee cultivation, we have used wild species to make the coffee crop sustainable." Research published in the journal, Science Advances, found conservation measures were "inadequate" for wild coffees, including those considered "critical" for long-term global coffee production. It always seems strange when we get told these scare stories, that the facts give a totally different narrative. Nobody knows what the future might bring, but I strongly suspect the biggest threat to coffee production will be deforestation. As usual with these sort of scare studies, they never take account of adaptation in the future. If a slightly warmer climate, or bugs, or coffee genes happen to be a problem eighty years down the road, then surely it is not beyond the wit of mankind to find solutions? Expanding growing areas, fertilisers, pest control, genetic engineering? I sometimes wonder what our civilisation would be like now, if the doom mongers had been in control two hundred years ago. Don’t do this! Don’t do that! We’re all going to die! How much of the technological advances we now take for granted would have been still born? A bit PCish, but the reality is that coffee farming in Africa is a low income activity, due to its inherent low productivity. Where improvements, such as new strains and fertiliser, could be made, they cost money, which the farmers don’t have. A vicious circle. Whether anyone will be prepared to take on such a low income job in years to come remains to be seen. I don’t believe fancy talk about fair trade will make the slightest difference to this. The country is actually doing pretty well. 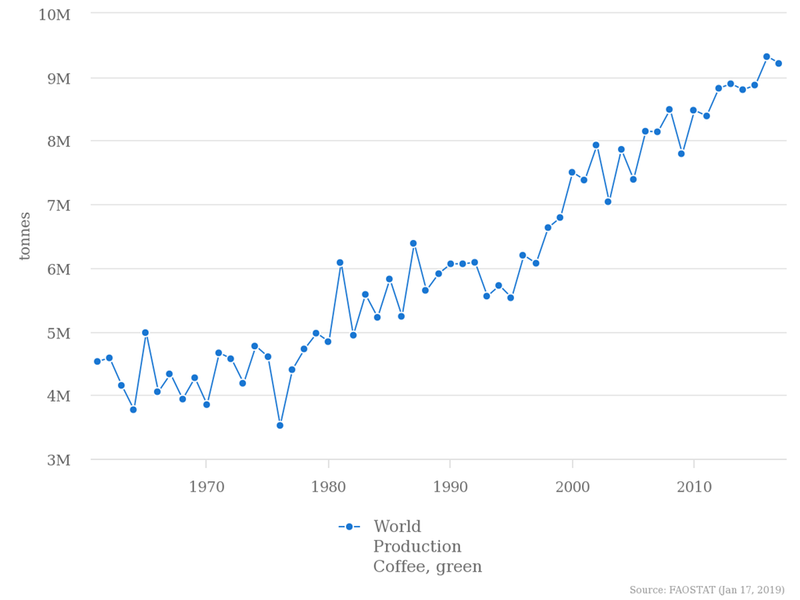 The claim that coffee production in Ethiopia is threatened by climate change is largely based on projections of lower rainfall. As usual with these simplistic studies, they merely assume that recent trends will carry on. There was a period of relatively high rainfall during the 1960s and 70s, but that was the exception. In recent years, rainfall has stayed very close to the long term mean. There have also been other decades in the 20thC when rainfall was much less than now, for instance the 1940s and 50s. 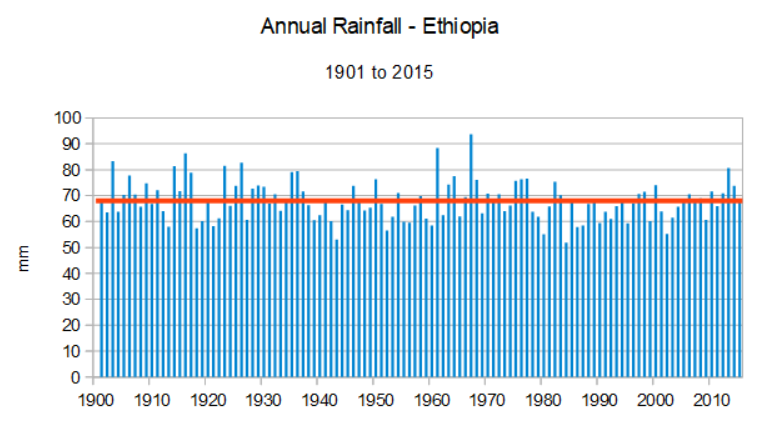 There is certainly no evidence that rainfall will decrease during this century. I think we can confidently expect to be still drinking our lattes for a long while yet, even though it might cost us a lot more! The climate believers believe in any pseudo-science based on unproven and unprovable computer models generated by comfortably-off academics. Facts seem irrelevant to them, however, the silly claims will ultimately show the models for what they are: i.e. low accuracy climate models. Another source of info is the International Coffee Organization. See Dec 2018 report: Figure 6: Global supply and demand by coffee year – annual production bars. Gerry, I observe that you have listed all of the alarmist predictions that have come true! We get this schtick every four or five years. In a year or two, when this has died down, we’ll hear BEER IS AT GREAT RISK! There must be some sort of al beebera project in say inner london schools and in effort to produce the daftest headline, or else at Auntie; they’re having a collective groupthink nervous breakdown and is Brexit derangement syndrome catching and I suppose it must be. The genus Coffea is a member of the Rubiaceae or Madder Family of plants. Although there are some 104 recognized species in the genus, only 2 provide most of the commercially consumed coffee: Coffea arabica (the primary one) and Coffea canephora (commonly referred to as “Robusta”). Horticulturalists have tinkered with these species and some others since discovery in Ethiopia in 1753. While all are native to Africa, many are raised elsewhere now. Due to being less fussy to raise and having a higher yield, the “robusta” coffee is cheaper to produce. It is used often in expresso blends while the C. arabica is considered a superior flavor. Brazil largest producer with one third of the world’s coffee, with 80% of their crop C. arabica. The 104 recognized species comes from a World Checklist joined in by Kew, New York Botanical Garden and Missouri Botanical Garden all of which adhere to The Internationa Rules of Botanical Nomenclature for validly published species. I find these hand-wringing articles without scientific merit. Another excellent contribution. Just goes to show how much you can learn from a blog as opposed to the legacy media. Recently had a pub quiz question to name the top 5 producers. A given that Brasil is in there. And Colombia. But I failed to trouble the scorers any further. Vietnam is No. 2!!! 4-5 are Indonesia and Ethiopia. Honduras is 6 just because my website shows that too. The credibility of BBC climate ‘news’ is on the edge of extinction, if they don’t wake up and smell the coffee. Like the polar ice caps, coffee is still here despite the prophesies of doom. The BBC believes just about every climate scare story.